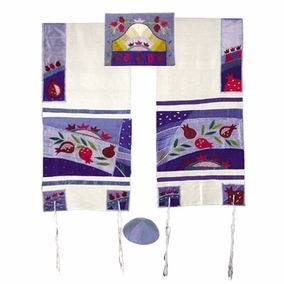 Pomegranates in Blue Raw Silk Appliqu?d Tallit CAT# TFA- 5. made of hand – woven raw silk. Raw silk is appliqu?d with embroidery forming the motifs. The set comes with a Tallit, Tallit bag and a Kipah . Sizes: 14” X 70”. The tallit gadol (traditionally known as tall?t gedolah amongst Sephardim), or "large" tallit, is worn over one's clothing resting on the shoulders. 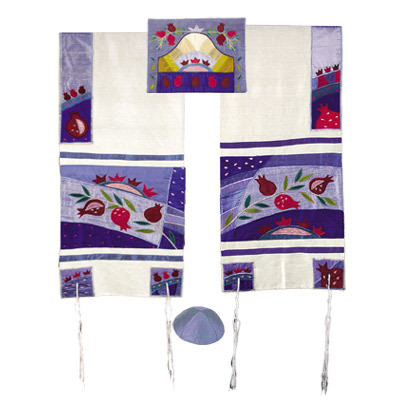 This is the prayer shawl that is worn during the morning services in synagogue and by the leader of the prayers during some other services. The Tallit gadol, which can be spread out like a sheet, is traditionally usually woven of wool — especially amongst Ashkenazim. Some Spanish and Portuguese Jews, however, have the tradition of using silk talletot; and cotton or linen are also traditional choices. In our days, other materials are also used — including synthetic materials like rayon, polyester and acrylic. Talletot may be of any colour, but are typically white, and usually with black, blue or white stripes along the lateral sides (see Historical Origins above for stripe explanation).